The Big Bang is still shrouded in mystery in many respects. Cosmologists use various ways to try and get information about the first moments of our universe. One possibility are cosmic magnetic fields, which were created by the birth of the universe and should have survived to this day. In the first fractions of a second after the birth of our universe, not only elementary particles and radiation, but also magnetic fields were generated. A team led by the Max Planck Institute for Astrophysics in Garching has now calculated what these magnetic fields should look like today in the universe – in great detail and in 3-D. 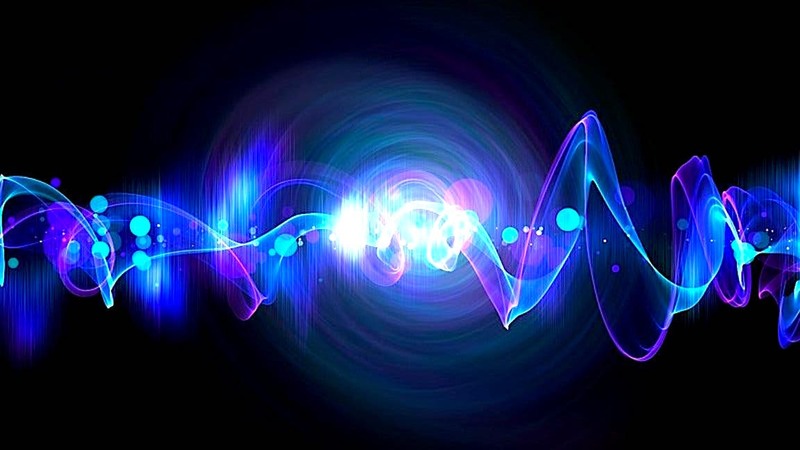 In addition to a number of highly speculative mechanisms, which have been proposed for this so-called magnetogenesis, there is a simple plasma-physical effect: the Harrison effect. This must have produced magnetic fields at the Big Bang. Vortex movements in the plasma of the early universe produced electric currents due to friction, thus inducing a magnetic field. Knowing the plasma vortices at that early time, one could calculate in detail how these magnetic fields were generated. If one also knew the plasma motions since then, one could calculate what these magnetic fields should look like today. The necessary information is contained in the distribution of the galaxies around us, as this is the result of the motion of matter since the early universe. Today we know the laws leading to the formation of galaxies quite well. This enables us – from today's galaxy distribution – to trace the evolution of matter distribution quite accurately. With this information, it is possible to predict the magnetic fields generated by the Harrison effect in today's universe. 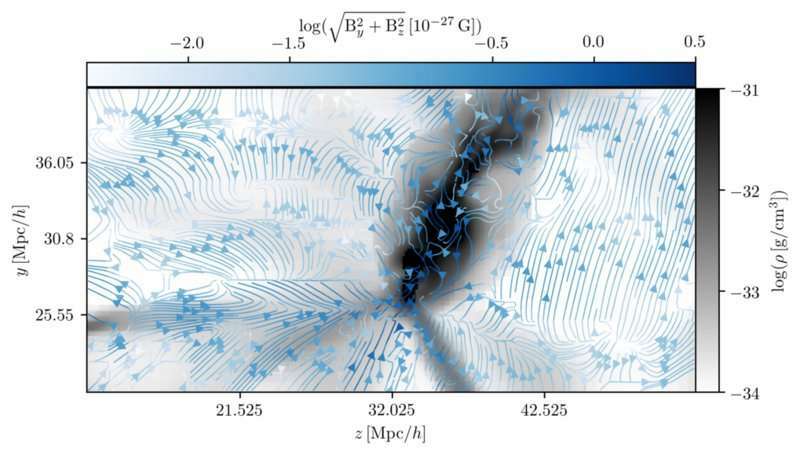 Cosmic fields: a slice through the Perseus Pisces galaxy cluster in the present Universe with the matter distribution depicted in grey and the blue arrows highlighting the Harrison magnetic field. Glimpse into the unknown: this sky view shows the Harrison magnetic field strength averaged within a sphere with 300 million light years radius around the Earth. The two regions with particularly stronger fields are the Perseus Pisces galaxy cluster (right) and the Virgo cluster. 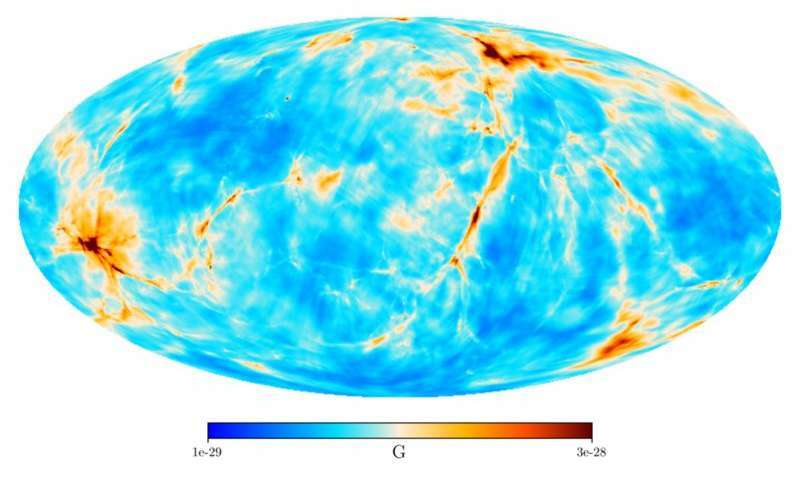 An international team led by the Max Planck Institute for Astrophysics used this logic to calculate today's remnants of the primordial magnetic fields in our cosmic neighbourhood. To this end, the researchers first investigated the distribution of galaxies in our neighbourhood and calculated the distribution of matter at the time of the Big Bang. They took into account the Harrison effect and finally translated the fields produced with it back into the present. The scientists were thus able to predict the structure and morphology of the primordial magnetic field in the surrounding 300 million light years. Unfortunately, the theory cannot be tested by observation: the calculated magnetic field is 27 orders of magnitude smaller than the Earth's magnetic field and thus far below the current measurement threshold. These magnetic fields are extremely weak, twenty-seven orders of magnitude smaller than the Earth's magnetic field. Nevertheless, the very precise predictions for the magnetic field structureas viewed from Earth. ) and at known places in the Universe show that we can understand our cosmos with high precision and calculate subtle effects within. And who knows how precisely we will be able to measure magnetic fields in 100 years – Einstein also thought that the gravitational waves he predicted would be too weak to detect.